When I got my first full-time job, I got my dad a MacBook Air as a thank you gift. I helped him set it up and explained that “Finder” is similar to “My Computer” on his old Dell computer and everything else worked just about the same. I was feeling pretty good about my “kind” gesture, but this feeling wouldn’t last for long. The very next day my dad called me and asked about “photos disappearing” and “nothing working like it should”. Soon, he gave up on learning how to use this MacBook entirely and went back to using his 10-year-old relic. Now, not only did it mean that my $1000 gift was basically useless, but also that Apple’s interface was very unintuitive. My highly educated, slightly stubborn dad gave up on his ability to use it entirely and settled for a much more inferior, but familiar experience. How could this interface be intuitive to young people and yet be impossible to navigate for older people? And how might we enable the senior population to navigate a society deeply embedded in digital experiences? Using a human-centred design approach, this case study attempts to provide answers to the above questions by first understanding and examining the root causes of seniors’ disengagement from technology. Then, I’ll propose a solution that could help make technology more accessible and inclusive. Author’s note: This article does not aim to perpetuate negative stereotypes of seniors or infer in any way that older people are collectively less intellectually capable than their younger counterparts. My main focus is to come up with strategies that would help create equal digital experience opportunities for everyone, especially seniors, who are a major part of that demographic. I used these design values as goals and objectives to help guide my research and design direction. They acted as a compass that would steer me back to shore every time I drifted away. A good design instils confidence in the user. Regardless of their age, education and background, users should not question their ability while interacting with a new product. In fact, they should feel empowered and in control. Design should make everyone feel included. The interface can be intentional and functional and at same time be beautiful and engaging. These two go hand in hand. We shouldn’t sacrifice the user experience to improve the aesthetic of the design and vice versa. Design elements should not merely act as ornaments; each should have an underlying function. Design should be trustworthy and transparent. Dark and unethical design patterns could not only damage the user experience but may also directly or indirectly cause harm to the user. Divergence is where we broaden the parameters of the design problem to explore more possibilities by gathering unfiltered quantitative (focuses on numerical data and measure) and qualitative information (focuses on behaviour and motivation). In this phase of the process no information is irrelevant, we look for connections in entirely unrelated fields and leverage existing strategies and information to help us better understand the problem space. Transformation is where we start sorting through our findings, and decide on the most thought-provoking for further exploration. It is important to avoid a solution-oriented mindset at this stage as it could make you biased and one sided. One way to do this is to write down all of your preconceptions, set them aside and move on. You can come back to this at the end of Divergence and Transformation once you have a clearer idea of the problem that you’re trying to solve. In many ways, technology shapes the way millennials live. However, its influence is less profound with older demographics. Seniors are largely unattached to technology; they use the Internet the least, but are the fastest growing group of users. More than a quarter of the population in Japan are 65 or older. In 2016, Canada’s seniors outnumbered the children, while less than 32% of this demographic are online. It is imperative, therefore, that attempts be made to capture this growing group of users. In my research, I came across an interesting article by Marc Prensky, an American writer, who popularized the terms Digital Natives and Digital Immigrants in 2001. He refers to the generation who were born into the digital world as digital natives, and those who were adopted to technology at a later point in life as digital immigrants. Digital natives are the “native speakers” of the language of technology. When they face a new product they expect the user interface to be intuitive enough that they would need no instructions. The digital immigrants, on the other hand, read the manual carefully first. This disparity could be a result of different educational styles. Millennials were encouraged to self-teach, research and explore, while the older generation relied heavily on learning from an instructor and listening carefully. Even though digital immigrants were the first generation to experience rapid technological changes, they experienced it at a different pace and in a different way. Dealing with extremely hard to navigate, highly technical interfaces shaped their mental model in a way that they perceive technology to be unintuitive and unforgiving. Lets use loading a 80’s Fuji film strip as an example to understand this better. If you didn’t read the manual carefully and loaded the film wrong, you could either damage your camera or realize your mistake only after developing the pictures. You’d blame yourself thinking you “failed” to load the film correctly, when it fact it was a design problem to begin with. This could have easily been prevented with a Forgiving Design system that would generate some sort of feedback to let the user know that they have loaded the film incorrectly. A forgiving design helps the user avoid making mistakes, and if they make one, it makes it easy for them to recover from it. The same model can be expanded to all digital experiences. Neuroplasticity is a term in neurobiology that proves “different kinds of experiences lead to different brain structures.” The human brain physically changes and organizes itself based on the input and stimuli it receives throughout life. Neuroplasticity debunks the popular belief that the brain does not change after the age of 3. It proves that transformations continue throughout life and affect the way people think and behave. Studies show that as a result of repeated experiences “particular brain areas of teenagers are larger and more developed”. Even though digital immigrants, for the most part, invented complex technologies and even the internet, they experienced it at a different pace than digital natives. Social psychology studies show that as a result of repeated digital interactions teenagers use different parts of their brain and think in different ways than adults. These digital experiences have programmed younger users’ brains to comprehend visual representations and create mental models of their digital experiences the same way that the older demographics’ brains were adjusted to accommodate television. Seniors perceive information differently than younger people. Their cognitive structure is sequential and millennials’ is parallel. This means that when it comes to dealing with technology, seniors require a step by step approach at a slower pace while the cognitive structure of millennials enables them to process multiple information at once. Think of cognitive ability as mental skills that we need to perform the most simple activities, from writing mail, to the most complex tasks like working out quantum physics equations. As we grow older our cognitive abilities deteriorate. Some of the cognitive skills involved in using a website are: Working memory: The ability to simultaneously grasp, retain, and manage new information. Spatial working memory: The ability to remember where things are located and actually find them. Perceptual speed: The speed at which a person processes information. Why do seniors tend to be disengaged from technology? To better understand older demographics’ experience with technology, I interviewed 6 seniors and 3 millennials and asked them a series of questions about the way that they or their parents interact with technology. The aim was to identify key inhibiting factors to full immersion in digital experiences. I categorized their responses as well as my research findings below. As can be surmised from the above response, generational differences in computer experience result in an imbalance of digital knowledge. While designers are constantly trying to innovate and create unique, forward-looking experiences, there is a large user demographic that still has not grasped the basic digital conventions. For example, in an attempt to create a minimal interface, designers are getting rid of “Home” in navigation bars. They find it redundant and argue that to most of their users (millennials), clicking on the logo to get to the homepage is intuitive, and usability tests confirm this. While this is an established digital convention for younger users, a study conducted by Blink, an American User Experience Design Agency, indicates that 80% of participants aged between 48 and 66 years old are unfamiliar with the practice of clicking on the company logo as a way to return to the homepage. To most older people, technology uses language in strange ways. This language barrier is even worse for non-English speaking users, who have to memorize functions by their appearance and learn how to navigate a product by trial and error. If interaction with the product is infrequent, there is a tendency to forget what has been previously learned and begin the entire process again. Translations, for the most part, don’t help either; they often appear equally confusing and strange. Visual representations, on the other hand, are universal and easier to recall. Millennials are immersed in digital experiences. They use technology to manage different aspects of their lives, from communication and gathering information to shopping and entertainment. Seniors, on the other hand, tend to use technology for a narrower range of purposes. In fact, 39% of the over 65 demographic use their mobile phones only for making calls. Another example is entertainment sources: the majority of millennials use the internet for entertainment; they access music and their favourite shows online, while seniors prefer traditional methods of listening to music and watching videos. Many seniors are sceptical of the idea of trusting the computer with their personal information. It is no surprise then that they are the least demographic likely to shop online. Another form of this scepticism is “cautious clicking”, a behavioural trait of seniors who think a wrong click could have consequences that damage their device. This holds them back from exploring and interacting with technology independently. Older people will have problems adapting to a new way of doing things. 32% of US seniors find the internet too difficult and 8% of those believe that they are “too old to learn”. When it comes to using new technology, 77% indicate they would need assistance and that they won’t be able to figure it out on their own. The older demographics also have a higher rate of abandoning a task if they fail at their first attempt. In a study by Nielsen Norman Group, seniors and younger users were given a set of tasks to perform. The error rate of seniors was more than double that of younger users and 45% of them abandoned the task completely after failing for the first time. Seniors are less likely to buy themselves new gadgets. They mostly use outdated hand-me down-devices that offer a much inferior experience. In a recent study conducted by Pew Research Centre, 19% of US seniors stated cost as the main reason that they are not online. They simply can’t afford to buy a new computer or have high speed internet at home. Among seniors with an annual household income of $75,000 or more, 90% go online and 82% have broadband at home, while only 39% of seniors who earn less than $30,000 annually go online and 25% have broadband at home. Many physical disabilities that make interacting with technology difficult are associated with aging. “Around 2 in 5 seniors indicate that they face physical challenges that make reading difficult, or suffer from a disability, handicap, or chronic disease that prevents them from fully participating in common daily activities”. Vision: Reduction in the amount of light that reaches the retina, loss of contrast sensitivity and loss of the ability to detect fine details are the inevitable side effects of aging that make interacting with a digital screen difficult. Motor Skills: As we grow older the nerves in our fingers become less sensitive. This makes our response time slower and inevitably makes it harder to interact with a touch screen. On average seniors have a response time of 1 second which is much slower than the 0.7 seconds response time on an Apple screen. This can be an even bigger problem if the user suffers from Essential Tremor (ET) or Parkinson’s disease, nerve disorders characterized by uncontrollable shaking. The National Centre for Biotechnology Information of America estimates that approximately 2.2% (7 million people) in the USA suffer from ET and about 0.15–0.3% of the population (0.5–1 million) have Parkinson’s disease . This means that a slight tremor on a touch screen can be registered as a swipe rather than a touch. These subtle “missed interactions” erode seniors confidence and make them feel inadequate. In a survey conducted by Pew Research Centre, 34% of the seniors who do not use the internet stated that they are not interested in having an online presence and don’t find it relevant to their lives. 41% of these respondents do not use the internet at all, 53% do not have internet access at home, and 23% do not use cell phones. At this stage in my process, I had collected enough information to create a User Persona. 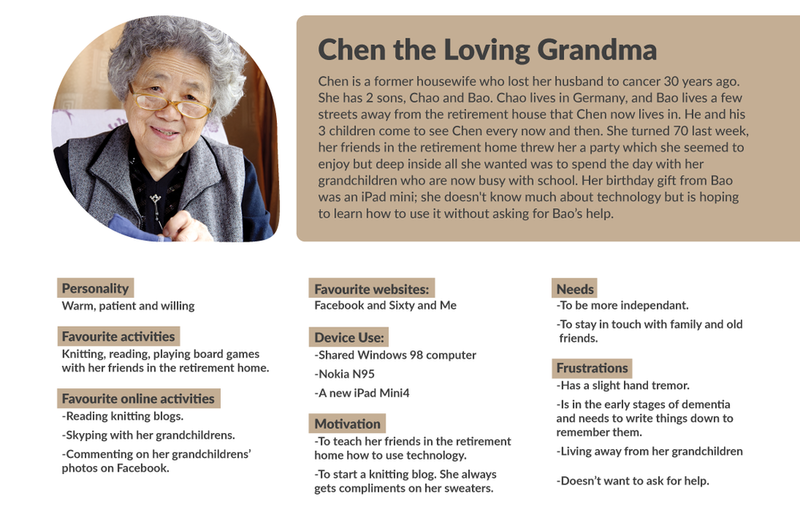 Designing this persona helped me in visualizing and focusing on the needs, challenges, motivation and goals of seniors. It enabled me to keep my design process and solution within context. 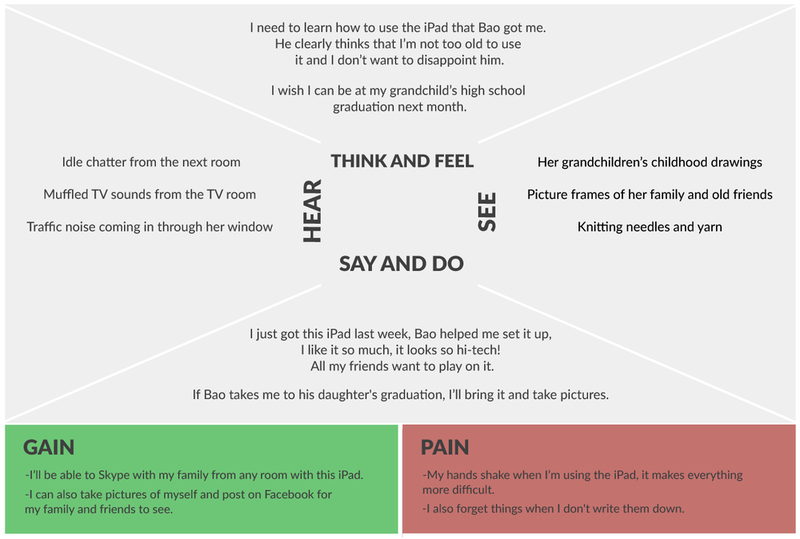 To gain an even deeper insight into how seniors experience technology, I created an empathy map using empathy and speculation. This enabled me to embody my users’ pains and gains, and helped me empathize by putting myself in their shoes. Next, to find out how industries are tackling this problem, I did research on the existing devices and services that cater to seniors. I found out that most of what exists in the market are hardware solutions designed to address specific needs and the rest are a simplified version of another product. While many may have benefited from these devices, they are exclusionary and to some extent patronizing. Ease of use and simplicity should not negate having a modern interface and a stylish device that everybody else is using. Ownfone is a UK based company that makes “the world’s simplest mobile phone”, which costs only £75.00. Ownfone stores up to 12 contacts and allows the user customize their own interface (keypad, colour and style), which will be printed on the phone. It only allows the user to make and receive calls and can last a year on a single charge! Doro is a Swedish phone company that mainly focuses on the senior market. They offer 2 smartphone models and one “Easy Phone”, which is a simplified flip phone. Seniors can compare models on their website and choose one based on their needs. It offers features like step-by-step tutorials, hearing aid compatibility, an assistance button and a web browser. Telikin is a simplified touchscreen computer that comes with preinstalled software that makes it easy to set up. It also comes with an external keyboard and mouse for seniors who struggle with touch screens. enTECH is a computer club created by University of Waterloo students that aims to “provide the resources, education and tools to help everyone feel comfortable using 21st Century technology.” They deliver technological education to seniors with the help of tech savvy volunteers. They also redesign and develop new accessible user interfaces. Gadget Guide is a Canadian startup with a tagline of “making technology friendly”. They offer door to door personalized sessions to seniors for $69 an hour (!). Webwise is an “online guide” website by BBC that covers topics on basics of using a computer and web. Convergence is when we bring ideas together to create a solution and find an answer to the question proposed in the beginning: How might we enable the senior population to navigate a society deeply embedded in digital experiences? My research helped me identify the key problem: we are designing a single experience for users with different needs and cognitive skills and expect it to work and resonate seamlessly across each user group. The tech industry’s one-size-fits-all attitude needs to change. There must be a shift towards designing unified experiences that would cater to both tech savvy users as well as users inhibited by it. An optimistic solution is designing parallel experiences for users at different levels of digital and technical awareness. These experiences could then be further customized according to the user’s preferences. Here we imagine the product as a game with different levels of difficulty, and give the user the opportunity to select their preferred level. Designing fully accessible and senior-friendly digital experiences comes with numerous constraints to the designer that may hinder the use of technology to its fullest potential. Designing parallel experiences would give designers the freedom to design innovative solutions that maximise the benefits of technology for the more technologically competent users and meet other users at their various levels of technological competence. This solution is not exclusionary and is not age specific but preference based. This would put the user in control by giving them the choice to customize their experience. It might not be the silver bullet that once and for all solves this wicked problem but it certainly is a step in the right direction. Mahsa Yavari is a UX strategist, a multidisciplinary designer and an animator who is passionate about creating meaningful, yet minimalist digital experiences. Check out her Medium profile here.